Acoustic Energy Reference 1 review | What Hi-Fi? Acoustic Energy is built on the success of its first product, the AE1. But the company recognises that no brand progresses by looking back. The new Reference 1 speakers are the company’s current take on what a small stereo pair should be like. They’re pretty close in size to the originals at just over 31cm high, but take the design further by sandwiching rubber between two MDF sheets for its cabinet. Acoustic Energy’s trademark metal mid/bass driver remains. In this case it’s an all-alloy unit with a hefty motor system to allow high volumes without over-heating. The tweeter is the brand’s favoured ring-dome, refined to improve smoothness and transparency, and surrounded by a faceplate that controls dispersion and integration with the mid/bass unit. And they sound very impressive. They aren’t fazed by high volume or seismic bass: play the likes of Tchaikovsky’s 1812 Overture or Massive Attack’s Flat of the Blade and the Reference 1s exude confidence. They’re immensely solid in the bass, and deliver transients with precision and punch. Your sofa won’t shake, but the 1s deliver satisfying musical punch. They’re also unforced and refined through the higher frequencies; feed them an edgy recording and they’ll make the most of things rather than sounding hard. Add a good sense of timing, a nicely judged tonal balance and the ability to work well at low levels, and you have a terrific pair of small speakers. 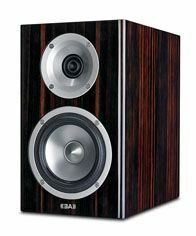 If you want a classic pair of mini monitors, buy the AE1s. If you want a taste of Acoustic Energy's future direction, the Reference 1 speakers are where it’s at.